Attend one of Mike Caro’s world-acclaimed poker seminars, filmed live by three cameras at the Bicycle Casino in Bell Gardens, California (Los Angeles area). 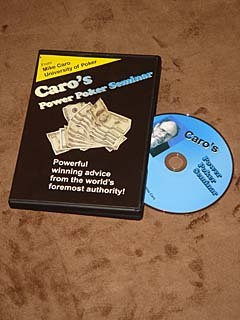 Learn Caro’s dynamic secrets to winning in one entertaining hour of intense poker training. In 1995, after 15 years of never allowing his poker seminars to be recorded, Mike Caro let the world inside to see the magic and drama of world-class poker education. Tells, hand selection, folding to make money, bankroll guidance, choosing the right games and seats, advanced strategy, and much more — it’s all here. Why and how you really can win at poker, but not at most casino games. Long-guarded secrets about betting, raising, and even checking for maximum profit. Caro shares his revolutionary research and explains how to apply it against opponents who are helpless against it. Be motivated to win like you never thought possible! In 60 easy-to-watch minutes, Mike Caro unravels the mysteries of scientific poker, makes them simple, and gives you the weapons you need to defeat even the pros! If you missed your chance to attend in poker, take a front-row seat. Mike Caro will explain the most profitable poker concepts ever made available to the public, presented in a way you’ll never forget!